It’s a sweaty project, but the sweat is worth the effort for scientists at the Air Force Research Laboratory working to better understand the links between materials, technology and warfighter performance. Born out of an AFRL and industry collaboration within the Nano-Bio Manufacturing Consortium, a wearable patch is helping researchers make ‘sense’ of the link between sweat and hydration. The field of wearable technology has grown significantly over the past few years, attracting the interest of industry, academia and military researchers keen on finding ways to better understand how biology and technology can augment the understanding of human performance across the spectrum. For the Air Force, the ability to better understand a warfighter’s physiological state in the operational environment can not only help improve overall performance, but may also help identify potential safety issues like dehydration before they have a chance to impact activity during operational events. “Heat stress can impact airmen during training activities as well as in the field of operation. This patch could serve as tool that can help us better understand hydration status in a noninvasive way,” said Ward. The sweat patch, which adheres to a person’s skin during activity, is enabled by advancements in microfluidic design for sweat transport, next-generation sensor materials and through novel integration concepts for reliable connections between flexible and electronic components of a system. As an individual moves and begins to perspire, the sensor embedded in the patch monitors the potassium and sodium excreted in sweat and transmits this information wirelessly to a mobile device or computer. A collaborative effort between the Air Force Research Laboratory and industry partners through the Nano-Bio Manufacturing Consortium has led to the development of next-generation wearable patches that can detect electrolyte levels present in human sweat. 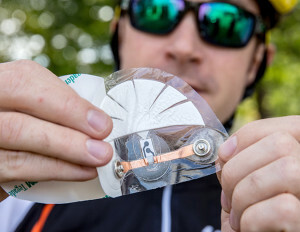 Using novel AFRL-developed sensor materials and microfluidic technology, the patches can measure sodium and potassium levels present in sweat and transmit this information wirelessly for scientific analysis. The patches will augment research on hydration with the goal of improving human performance in heat or high-stress conditions. “Sodium and potassium increase and decrease depending on time and activity. We can watch these levels go up and down from a distance, in real time,” said Ward. Development of the patch, a team effort since 2014, sought to address a number of materials and processing challenges, according to Ward, particularly as the understanding in the field of flexible, wearable electronics continues to evolve rapidly across academia and industry. One ongoing area of improvement, augmented by the expertise on the AFRL Advanced Development Team, centers on the performance and reliability of the sensor technology embedded in the pad. “The sensor is a multi-material and multi-layer component of the patch that must maintain the ability to both accurately sense the electrolytes of interest and convert the electrolyte concentration to an electrical signal for transmission of the sweat data wirelessly for analysis. This functionality requires that the sensor materials are selective and reliable,” said Ward. The first generation of the patch was laboratory tested with simulated sweat by the GE Global Research Team. Additional physiological performance testing occurred under Dr. Adam Strang at the AFRL 711th Human Performance Wing’s Signature Tracking for Optimized Nutrition and Training Laboratory. 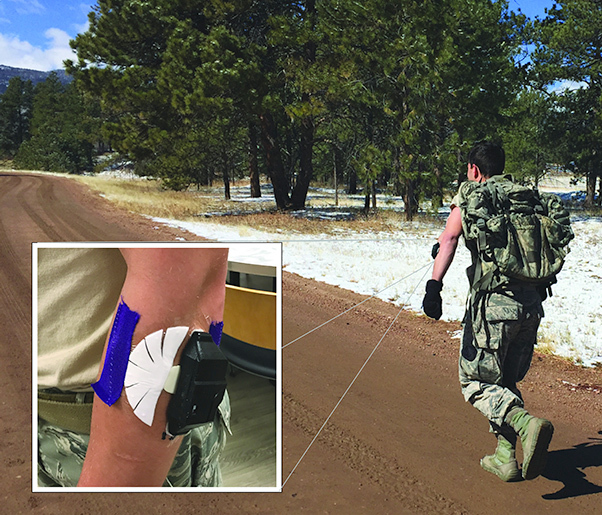 A field test of the device took place this March in Colorado Springs through a collaboration between the AFRL’s Materials and Manufacturing Directorate, the 711th Human Performance Wing and U.S. Air Force Academy cadets. This multi-day testing event provided the researchers key information on the ability of the patch to perform in a relevant Air Force environment. Academy cadets wore the patch during a three-hour workout that included a run through the academy obstacle course, a one-and-one-half mile ruck march and a series of callisthenic exercises that included pull-ups, push-ups and sit-ups. The team has started work on the next generation of the sweat patches, which will take a similar form factor, but aim to be thinner, more robust and will incorporate additional sweat assessment capabilities. As they mature the technology, the team will be exploring the possibility to enable the commercialization and transition of the next-generation sensor materials with industry partners in the healthcare and fitness realms. A field tester at the U.S. Air Force Academy wears an Air Force Research Laboratory-developed sweat sensor during a ruck march as part of field testing of the AFRL-industry collaborative product. The next-generation wearable patch can measure select electrolyte levels present in human sweat and transmit this information wirelessly for scientific analysis. The patches will augment research on hydration with the goal of improving human performance in heat or high-stress conditions. In any case, the sweat patch is a revolutionary tool in the AFRL research arsenal, with the potential to lead to better understanding of hydration and human physiology for greater safety and performance on the battlefield. The sweat patch development team received the 2018 FLEXI Award for R&D Achievement at the SEMI Flex Conference and Exhibition in Monterey, California. FLEXI awards recognize groundbreaking accomplishments in the Flexible Hybrid Electronics sector. 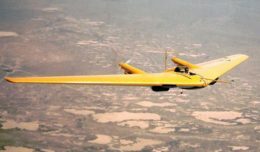 The award-winning team is comprised of researchers from the Air Force Research Laboratory, GE Global Research, UES, Inc., the University of Arizona, University of Connecticut, University of Massachusetts Amherst and Dublin City University.